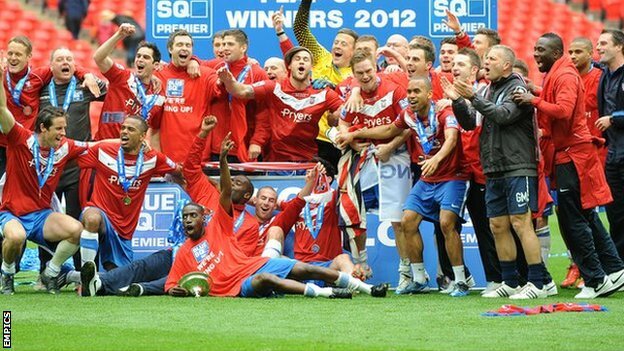 An historic Wembley double made it a season to savour for York City fans everywhere. With a significantly changed side (Oyebanjo, Blair, Challinor, McLaughlin and Walker) were among the newcomers), City started their 8th Conference season with high hopes. Having finished the previous seasons in 8th place, there were realistic hopes of a promotion push. These hopes soon proved well founded as £60,000 signing, Jason Walker enjoyed a prolific start to his City career until an injury in October badly curtailed his season. He wasn't to return until March and then struggled to recapture his early season form. Meanwhile, City struggled slightly without, him but started on a FA Trophy run. A 3-0 replay win at Solihull Moors was followed by a 6-2 win at Salisbury. March was pivotal. City beat Luton in the FA Trophy semi final and retuned to Luton 2 weeks later to win a key league match, both games being marked with a late result changing goals for City. 4 wins and a draw in our last 5 games sealed 4th place and a semi final play off game. City’s play was characterised by a very tight defence and late goals in key games, suggesting a fit side. The front 3 of Walker, Bair and Chambers provided guile and speed which was far too much for many Conference sides. The neat, crisp passing style of play was admired throughout the game. For the semi final, City drew the home leg 1-1 with Mansfield making us the underdogs for the return. Again it was tight game, City’s strength told as a Matty Blair headed goal deep into extra time gave City a 1-0 win over Mansfield and a second trip to Wembley. Before, the play off final, there was the small matter of The FA Trophy Final against Newport. City were on top for the most of the game, stamping our authority on it with 2 quick fire goals half way through the second half. Blair's blistering pace saw him on the end of a through ball which he lifted over the advancing keeper from 20 yeards to make it 1-0. 8 minutes later, his run down the right, after an intricate passing move saw him cross to give Lanre Oyebanjo an easy 3 yard tap in. 2-1. Game over. 8 days later, City were back at Wembley for the big one, the play off final against Luton. Heavily outnumbered, City supporters saw us concede an early goal. City went on the offensive and equalised through Ashley Chambers after 26 minutes. Early in the second half, Matty Blair hit the winner, a rather fortunate effort as many thought him offside when watching the replay. City held on, largely untroubled. Given our rivalries with Luton, all the more sweeter as it our 4th win (plus a draw) we’d got against them during the season. In a 2013 vote to celebrate 125 years of the Football League, 2011/2 was voted City’s greatest ever season gaining 74% of the vote. Next best was 1983/4 with just 9%. Commendably, Gary Mills started our return to The Football League with a largely unchanged squad. However, the guile of the front 3 in the Conference didn't work. Up against big defenders, their skill was easily over powered. Mills stuck with his favoured 4-5-1 formation was reluctant to change. With relegation looming he was sacked in March 2012. Of the Wembley team, only Lanre Oyebanjo and James Meredith can be said to have really made their mark in the league football. Read an article by Dave Flett that appeared in The Press in May 2012 recalling City’s memorable double Wembley winning season of 2011/2 that ended in FA Trophy glory and a return to the Football League. Completing an unprecedented non-League double at Wembley, Mills' team, after lifting the FA Trophy, can now testify, like Alan Little’s players 19 years previously, that there is no better way to go up a division than by winning a play-off final at the world-famous home of English football. For a club the size of City, there is no bigger game to prevail in than the Blue Square Bet Premier promotion decider with its estimated three quarters of a million pounds reward, dramatically reversing overnight an economic outlook which has become bleaker with the passing of all eight years since the team dropped out of the Football League in 2004. Every hangover needs a cure, though, with Mills' positivity proving the perfect remedy at Bootham Crescent. Chairman Jason McGill has proven himself a credible recogniser of managerial talent with Mills' predecessors such as Billy McEwan and Martin Foyle, equally surprising appointments at the time, also deserving recognition for the parts they played in rehabilitating City following the plunge into unknown Conference waters even allowing for the unhappy endings to their spells at the helm. Ruling with dignity and determination, though, Mills commands great credit for securing the prize that narrowly eluded McEwan and Foyle. Most of all for assembling the players that made it possible. Had they also learned early in the campaign that Andre Boucaud, such a fundamental figure in the team’s swashbuckling start, would be sold to Luton in January whilst Michael Ingham would be replaced by 43-year-old veteran Paul Musselwhite in the three games left to clinch a play-off place, some would have again been prone to panic. Along with Kerr and summer signing Paddy McLaughlin, City’s midfield triumvirate passed a succession of teams into submission in those early summer and autumn days. The second half of the campaign became less aesthetically pleasing, the likes of full-backs James Meredith and Lanre Oyebanjo, as well as stalwart utility man Dan Parslow, compensated for a loss of craft with bundles of graft. Jason Walker’s ten goals by October 1 was the first of a number of club records set by Mills' team throughout the season and his overhead kick goal against Grimsby deserved to be enjoyed by the rest of the world when it became a YouTube sensation. Later highlights included Jamal Fyfield running three-quarters the length of the field before firing in a last-minute winner to settle a pulsating five-goal thriller at Grimsby. It epitomised more than any other single moment in the season, a doggedness on the road that would see the team lose just three away league games, another club record. His heroics left City supporters in raptures and, if a good measure of any season is provided by the numbers that come through the turnstiles, then one last club record, the team’s highest average attendance (3,097) during the Conference era speaks volumes for the efforts of Mills and his players in 2011/12. Footnote: In September 2011, City's game at Bath was postponed due to international call ups. 3 players (McLaughlin, Oyebanjo & Boucaud) were called up for international duty with another 3 players (Fyfield, Blair and Potts) selected for the England C squad. On 28th February 2012, Blair and Chambers played for England C against Italy. Chambers withdrew from the June squad to play Russia through injury. A year later, on 7 September 2012, Patrick McLaughlin skippered Northern Ireland Under-21s against Macedonia (NI lost 3-1) in Belfast on Friday evening and played the final game of the U21 campaign the following week in Denmark (a 3-0 defeat). Never lived up to Gary Mills' expectations following his November arrival. Lacked sharpness throughout the season and, when given a chance to impress, displayed suspect temperament and ill discipline. Needs to act quickly to resurrect a once promising career. Appearances: 3 (8); Goals: 1. Rating: 5/10. Phenomenal season for the one-time Racing Club Warwick winger, who got the vital goals to send City to Wembley twice before opening the scoring in the FA Trophy final and getting the winning strike in the play-off final. Hard to recall a player with his stamina levels at the club in recent times and also finished the campaign as the team’s leading marksman with 20 goals. His individual display during January’s 3-2 home victory against Ebbsfleet was the best of the season, single-handedly compensating for his side’s numerical disadvantage following Scott Brown’s 15th-minute red card by doing the running of more than two men. Left the League of Ireland behind to score on his debut in City’s 6-2 FA Trophy win at Salisbury in January. A decent attacking option in the penalty box at set-pieces with his movement and aerial ability. But the former Blackpool forward struggled to make an impact when he started games. Struck down by a dislocated shoulder in his only start for the Minstermen at home to Fleetwood. That ended his season before it had really begun but he made an impressive cameo appearance as a substitute in March’s league victory at Luton. Sold to Luton for twenty five thousand pounds in January but his contribution during the club’s impressive start to the season should not be forgotten. Displayed skills and mastery of a football rarely seen at Blue Square Bet Premier level and proved himself an excellent retainer of possession. A record of just one goal and no assists, however, illustrates the Trinidad & Tobago international does not always apply his talent where it matters most -in the final third of the pitch. Brought in as a replacement for Boucaud but never came close to filling that void. Did not look match fit on his arrival and struggled to play at the tempo demanded by Gary Mills. Was also guilty of a couple of reckless challenges, one leading to a first-half red card against Ebbsfleet, but did contribute as a substitute in the big Trophy semi-final and play-off final contests against Luton. A 31-year-old boasting one of the biggest success stories of the season. Snapped up from Kettering, where he was on non-contract terms and struggling to resurrect a career that had seen him ply his trade as a midfielder at eight different Conference clubs. Quickly converted into a right back by Gary Mills and displayed great composure, as well as an ability to start off attacking moves from that position. Having struggled for consistency in spells during the season, found his best form on the biggest stage at Wembley, where he was City’s best attacking option in both matches. He topped the assists table at the end of the campaign and made his mark at important times. When he is positive and runs at teams, he frightens anybody in this league and, if he can add a more ruthless streak to his game, the former England youth international will also enjoy a greater goal haul next term. A very solid performer at the back after joining the club in February. Brought assurance and positional sense to the City defence. Only question mark regarded his fitness levels, causing him to come in and out of the side with injury niggles. Did really well to break into the team as a centre back at the start of the campaign considering the competition for that role. Also gave some memorable displays at left-back, most notably when he charged three-quarters the length of the field to score a terrific last-gasp winning goal at Grimsby and also when he delivered the perfect cross for Matty Blair’s header that ensured an equally as dramatic finish to the FA Trophy semi-final against Luton. Performed excellently in certain matches, but not so well in others and must get rid of the odd stinker. Proved himself a very mature defender for a teenager. Not as strong going forward as other left-backs at the club like James Meredith and Jamal Fyfield but rarely caught out of position or beaten for pace. Only briefly used in his more recognised centre-back role for City but looked a natural when employed there. The biggest disappointment of all Gary Mills' summer signings. Managed just one goal in between loan spells at Forest Green. Struggled to come close to Jason Walker’s standards as a lone central striker and will need to do better if he is going to figure more prominently during the second year of his City contract. Hard to remember many occasions when the former Northern Ireland international let his team down throughout the season. Any errors were few and far between, which shows impressive consistency at this level of the game. His handling and decision making was almost flawless and, when called upon, he made several vital saves. First-year apprentice who was given a run-out as a second-half substitute in the dead rubber match against Forest Green on the final day of the regular season. Did not seem daunted on the right wing and delivered a couple of decent crosses. Will hopefully develop physically during the next season of his scholarship. Inspirational anchorman in the middle of the park who deserved to end a great season with two Wembley appearances. That opportunity was denied him when he suffered knee ligament damage following a Keith Keane challenge in the FA Trophy semi-final, second leg clash at Luton. Ended a 121-game long wait for a goal with his winning header in the quarter-final triumph at Grimsby but, what he lacks in potency, he more than makes up for with his willingness to receive the ball and drive his team forward. A succession of injuries saw the long-serving defender play no part after January. It is a testament to his team-mates that the back four did not suffer in his absence. Will hope for better fortunes next term. Impressive first full season in professional football for the former Newcastle United reserve. Only James Meredith started more games from City’s outfield players and a return of 13 goals, as well as 14 assists, points to an impressive contribution from midfield. Cultured and a specialist with free-kicks and long-range shots, his supposed weaker right foot also got stronger as the season wore on. Recovered from an underwhelming start to the season to hit previous heights at left back, before making an unexpected transition into midfield during the last three months of the season. Composed on the ball in that area of the pitch, he also never shied away from travelling forward in possession and closed down opponents quickly. Could arguably have a bright future in both positions. Extremely exciting find by Gary Mills last summer. The Glenn Hoddle Academy graduate frightens teams on the ball with his pace, directness and skills. Better when employed on the wings rather than as a third midfielder, his starts were limited but nearly always contributed something in an attacking sense. Was the epitome of calmness when many were panicking as Michael Ingham suffered a shin injury with three games left to secure a play-off place. The 43-year-old shot stopper, who had hung up his professional gloves six years earlier, went on to mark the start to his City playing career with three consecutive clean sheets, a club record. Not the most agile these days but his experience was there for all to see and can also claim a role in Ingham’s exemplary campaign as Bootham Crescent’s goalkeeping coach. Another player whose season was interrupted by injury. Used in midfield towards the end of the season, where he gives the team energy when fit. Probably still best employed as a rampaging right back, though, with the ability to deliver a great cross or pop up unexpectedly in the six-yard box to find the net and his brave far-post interceptions in the play-off final against Luton will live long in the memory. Such were the quality of his contributions in defence and midfield during the run-in to the end of the season that it is hard to imagine he only started two league games before Christmas. Continually under-rated by sections of supporters and managers alike at Bootham Crescent despite six years of sterling service to the club. His performance in midfield at Alfreton confirmed his unheralded ability on the ball is almost a match for the endeavour and commitment that is always a given with him. The finest crosser of the ball in the squad on his day as his high assists per games played ratio proves. At other times he was really lacklustre and his deliveries also suffered on those occasions. Needs to be more consistent if he is to kick on in his career next season. Had to be patient for his chances in the side but came to the fore in the latter stages of the season. Comfortable on the ball and possesses a wide range of passes. Just needs to grow in confidence and work on his composure and power when in shooting positions. Not the second season many would have hoped for considering his goalscoring exploits during the latter half of the previous campaign. Probably suffers most from Gary Mills' preference for a 4-3-3 formation and rarely looks comfortable in the lone central striker or on the flanks. Sometimes struggled with the quick tempo that Mills insists upon too, but always liable to grab a goal, especially from the bench. Made a mistake-strewn and cumbersome start to the season, culminating in the concession of two penalties at old club Tamworth. Became a towering presence after the turn of the year though and rarely put a foot wrong. Answered any questions in the process concerning his place in the team and standing as skipper. Looked bright in his fleeting appearances for City. Concerns that previous clubs have held over his attitude, though, resurfaced off the pitch and he was told by Mills to stay away from the club for the final two months of the season. Needs to mature quickly if he is to fulfil his potential. Blessed with strong technical ability but looked a little laid back at times and, like his Sheffield United parent club, City struggled to pinpoint what his best position might be. Did not really come to terms with swapping life in the Bramall Lane reserves for the intensity of a Blue Square Bet Premier play-off push but played his part by getting the goal at Braintree that secured a play-off place. Talk of seven-figure transfer fee was justified during a sensational first two months of the season. Reached ten goals by October 1, the earliest any player has managed that landmark in City colours, but equally as impressive was his hold-up play, awareness and ability to outjump much bigger adversaries in the lone central striker role. Injury then halted his progress throughout the winter but he returned in April to claim crucial goals against Newport and Cambridge, a real class act. Goals: Blair 20, Walker 18, McLaughlin 13, Reed 12, Chambers 10, Smith 4, Challinor 3, Fyfield 3, Moké 3, Oyebanjo 3, Blinkhorn 2, Meredith 2, Own goals 2, Pilkington 2, Ashikodi 1, Boucaud 1, Henderson 1, Kerr 1, McGurk 1, Tonne 1. Assists: Former England youth international Ashley Chambers finished the season with the most assists – his tally of 15 placing him one ahead of midfielder Paddy McLaughlin. Assists: Chambers 15, McLaughlin 14, Blair 9, Moké 8, Pilkington 8, Reed 8, Walker 8, Meredith 7, Challinor 5, Kerr 4, Oyebanjo 4, Potts 3, Blinkhorn 2, Parslow 2, Smith 2, Bopp 1, Fyfield 1, Henderson 1, McGurk 1. Cards: Skipper Chris Smith boasted worst disciplinary record with a total of 12 yellow cards. Since the introduction of three points for a win in 1981, York City’s tally of 83 this season has only once been bettered in the club’s history and that was in the Fourth Division championship campaign of 1983/84 when they notched 101. Under two points for a victory, their best season was 62 points in 1964/65. 23 wins has only been bettered on three occasions, 31 in 1983/84, 28 in 1964/65 and 24 in 1954/55. Just three away defeats and 21 goals conceded on their travels is the best in the club’s history and only twice have they exceeded the 38 goals scored, 49 in 1954/55 and 41 in 1955/56. For the third time in the last six seasons, City have a better away record than home. Previous to that, the club had only done that once before, in 1946/47. City completed nine league doubles, only beaten by the 1983/84 side, which achieved 11. For the first time ever, City have not lost by a margin of more than one goal. The average league crowd of 3,097 is the highest since the club dropped out of the Football League in 2004. Total P 358, W 143, D 103, L 112, F 483, A 414, Pts 532. The Press Player of the Year Blair 34 points, Walker 33, Smith 32, Kerr 28, Meredith 26, McLaughlin 24, Chambers 23, Parslow 23, Ingham 19, Challinor 17, Fyfield 16, Oyebanjo 16, Doig 11, McGurk 10, Gibson 9, Moké 9, Reed 6, Boucaud 5, Pilkington 5, Blinkhorn 2, Henderson 1.